Dustin Byfuglien knocked down a Devils clearing attempt on the left wall. Jack Roslovic picked up the loose puck, moved into the slot, before snapping a shot over the blocker of Cory Schneider and in. Nikolaj Ehlers sent a pass from the left corner to Blake Wheeler just below the left circle. Wheeler turned and found Mark Scheifele in the slot. Scheifele snapped a one-timer glove-side on Schneider and in. Damon Severson sent a pass to Jesper Bratt behind the Jets net. Bratt took the puck to the left corner before sending a backhand to Brett Seney in the slot and he one-timed a shot just inside the right post. Jacob Trouba held the puck in at the right point and took a shot that redirected off a stick to Mark Scheifele at the left of the crease who knocked the puck behind Schneider and in. Damon Severson fed Blake Coleman at the Jets blueline. Coleman moved into the left circle before snapping a shot over the blocker of Connor Hellebuyck and in. 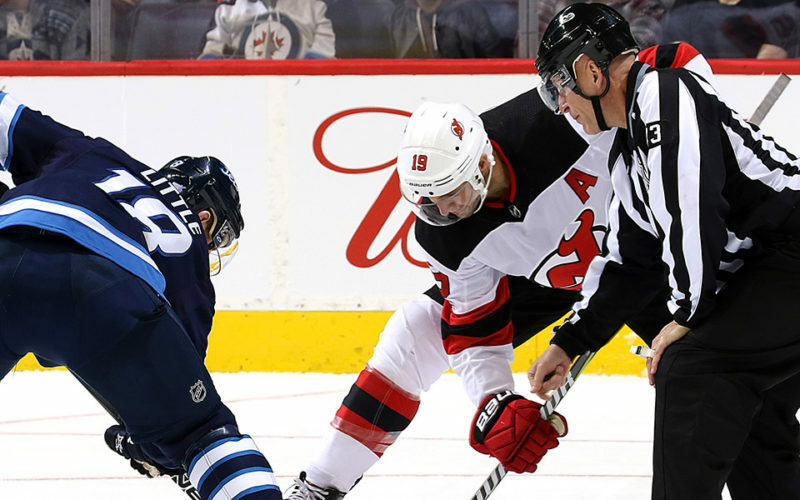 With a delayed penalty coming to the Devils and an extra attacker on for the Jets, Blake Wheeler fed Mark Scheifele in the slot. He’s wrist shot missed the net, but the rebound bounced to Nikolaj Ehlers at the bottom of the left circle. Ehlers fired a shot over the blocker of Schneider and in. Bryan Little dropped a pass to Kyle Connor at the Devils blueline. Connor sent a pass to Mathieu Perreault in the right circle who one-timed a shot through the legs of Schneider and in. Improve to 10-5-1 on the season and 7-1-1 Bell MTS Place. Have now scored the opening goal in five consecutive games and are 5-2-1 this season when scoring first. Matched a season high for goals in a game with five, which has been done four times previously. It’s the second consecutive game that the Jets have scored five goals. Finished the night 0-for-1 on the power play, snapping their streak of 11-consecutive games with a power play goal. The Jets have won the last five meetings against the Devils and improve to 11-1-2 in their last 14 games against New Jersey. The Jets won the 61% of the faceoffs tonight. It’s the seventh straight game the Jets have won more than 50% of the faceoffs. Won 8 of 10 (80%) of his faceoffs tonight. Scored in the second period to extend his goal scoring streak to three games (3G). Scored his first goal of the season in the first period. Scored two goals tonight for his second multi-goal game of the season. Finished the night with three points (2G, 1A). It’s the second consecutive three-point game for Scheifele this season. Led the Jets with 22:37 of ice time tonight. Extended his point streak to 10 games with two assists tonight (2G, 17A). Extended his assist streak to eight games (16A). Has multiple assists in four consecutive games. Now leads the NHL lead with 20 assists, one ahead of Colorado’s Mikko Rantanen. Tied for the team lead with three hits. Lowry leads the Jets with 50 this season.